I don't know what I expected to enjoy the most about being a mummy. I thought it might be togetherness, the intimacy of breastfeeding, reading, playing, finding new toys to love, and going places together. What has suprised me is that what I enjoy most is observing Joseph. Looking at how he views the world. I am endlessly fascinated by what he finds fascinating. Sounds, television programmes, different foods, the sights outside our window. Joseph's favourite spot in the whole world is his highchair by the living room window. Our street is not exciting, Accrington brick houses, the odd person walking past, kids playing after school. This morning some noisy Canadian geese flew overhead, squawking, and Joseph gazed at them, cooing after them. It was just so lovely, something so mundane, that you could so easily overlook, if you didn't have a brand new human sponge eager for new experiences. When he was a little baby, his surroundings were unchanging. Lights were always the same, sounds were the same, even the people didn't change. When Joseph came home, overstimulation was constantly a problem. I kept him quiet, kept toys to a minimum, even his clothes were kept subtle and comfortable and non stimulating. The past few months have been like watching him come out of his shell. He observes, he plays, he sings, he tries to communicated, he eats chunky lumpy food and is trying to feed himself. I am not sure how I will feel as his independence grows, and he needs me less, but I hope I will always learn from him. Tonight myself, and a lot of people like me have been watching this. Every week this program follows two women in labour, giving birth to their babies. Tonight, was different. The babies had already been born, but should have still be in the safety and comfort of the womb. Instead, these babies were in a neo natal unit. One of the neonatal nurses said it best "its a whole other world behind these doors". In the unit they showed parents on either side of an incubator changing a nappy. It brought back such happy memories, that ten minutes of normality, of changing your baby, touching your baby, doing something positive. But what I found personally difficult for me, is that I no longer recognise Joseph as that baby. I can't relate to that little person (one of the mums on the unit in the program said her baby looked like an alien - which is how I felt too), to the frail, tiny being who some days fought for his life. Which, I suppose, is progress, that I am living in the now, with a strong, happy, bouncy boy. Joseph is a success story, he is the reason neonatal units exist, and, to be political for just a wee moment, should be adequately funded, so that more mums like me, can have their success stories at home, tucked in their cots, sucking their blankets, where they belong. And a special mention to my mum friends here for holding my hand tonight! I've been reflecting today on my own journey to motherhood, and got to thinking about Joseph's first week. Joseph was born on a Friday. I spent the whole weekend trying to get my head around the fact that my pregnancy was over, and that I had a child. It's really hard, and I think all my special care mums will feel agree, to believe you have a child. Your in a hospital room, your baby is not with you (in my case on another floor and down the hall) and your caught in this half life. It wasn't until the Thursday my maternal instincts kicked in. Joseph became critically ill on the Tuesday. His stomach had early stages of NEC (necrolitising enterocolitis). He was being fed through the umbilicus, and they could no longer do this, due to the infection. But they couldn't begin to solve the problem until Joseph was stable. I was asked to give permission for a long-line to be inserted. This goes through the babies arm (in Joseph's case, sometimes its through the head) and straight into the stomach, as I understand it. On the Wednesday night one of the nurses came to see me and told me that they had tried twice, and it had failed. That if they couldn't do it, Joseph would die, and they would have one more attempt. I didn't panic. I'm not sure if the amount of medication I was on protected me from what was happening, or I just had so much faith in Joseph that he would be fine, I just don't know. I opened the doors of the incubator, held Joseph's foot, and explained to him exactly what they would do and why. I asked him to show the doctor the right vein, to stay relaxed, and let him finish the procedure. I told him I loved him, and that I believed in him. At that moment, I felt like his mummy. I hadn't held him yet, but I knew him and loved him. His consultant came in on Thursday morning to ask for my permission. I glared at him and said "right I am the mummy, and this time you do it my way!". He glanced at his registrar (like Noah's ark doctors come in pairs!) and said "ok mummy what is your way? At this point I will try anything". "Talk to him. Tell him what you are doing, reassure him, treat him like a baby" He smiled and said "I never do that, but for you, I will try". So I left whilst they turned special care into their mini operating theatre. I spent the day in my room, listening to my iPod, expressing, and sending all my thoughts and love to Joseph (and the clinical team). I came down at 3 pm, it was still an operating theatre, so I turned to go, but the consultant gravely came out. My heart sanked. He put his arm around me, he smiled, "I did it your way. I have learnt something today. Mummy's are the best doctors. It's worked." The following day the consultant came to debrief me. After he had finished he said "what do you do, in here, every day". I smiled and said "I sing, I bring in photos, I tell him about our lives, about his home, about our family, I massage his feet, I do containment holding, and I sing." He said to me "you must keep doing all these things, especially the massage, he is the best 27 weeker we have ever seen, and its because of you." On the Monday, he had gone, to be replaced by another locum. But the senior neo natal midwife on duty brought over something, it was a prescription form. And on it was "Mummy massage repeat as required daily until discharge". When Joseph was in special care my overwhelming feeling was isolation and separation. I was in hosptial for 8 days. I was kept in a room on my own, in antenatal. Which was lovely because I had my own space and was away from the mums with babies. Except it made me feel like a freak. I wanted to talk about my baby, and share those first moments with other mums. I remember feeling a pang of sadness as I watched babies with their mums, and people making noises about smelly nappies. I would have given anything at that point to change my babies nappy. My opportunity came two weeks after Joseph was born. It was carefully planned and orchestrated that I would do Joseph's "cares" one evening. Joseph was still well under 2lb at this stage. His skin was transparent. He looked like a miniature old man! A beautiful old man! I felt so nervous, I stood in front of the incubator looking at my beautiful teeny baby, and marvelling at him. 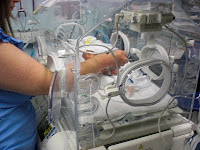 Fabia, one of the senior neonatal midwives stood on the other side and talked me through it. It was just so lovely doing something so normal. I was worried I wouldn't manage, with just my hands through the portholes, still separated from my little baby, but so much closer. It was like changing a nappy on a little hairless kitten! He had no fat at all, he was just soft skin with bones protruding. Its hard for me to imagine those slim small legs when now he has delightfully baby-like chubby thighs! Over time it got easier. Corey and I shared care times, I would do the morning, and he would do the evening. It was the highlight of his day, and mine. As we got more competent, we were left to get on with it. It was like having a baby, almost. But once Joseph moved to HDU things got complicated. Although only in the next room, care times got messed with and confused as there were more staff and communication was not always clear. I remember one day ringing my sister in tears because a nurse had messed up and done Joseph's cares. For six weeks I had been going in at 11am and all of a sudden they decided to change it. I was devastated. I went out into the carpark and cried and cried. I felt like they'd taken the one meaningful task of my day away from me. And they had. When you only get to touch your baby once a day for five minutes, every second is precious. Even now I take no nappy change for granted. I enjoy that intimate time with Joseph, and its even more fun now that he giggles and blows raspberries, and tries to put his feet in the contents!